Cloud Drive, Manage your cloud account like never before . With the support of Dropbox, Onedrive, Google Drive, Box and Mega. Experience a truly Personalized Experience with Cloud Drive. Set your own Personal password or Windows Hello for better Security. With a beautifully Designed Dropbox, Onedrive and more, Enjoy it as much as you can! Why Cloud Drive? Well because, All of your Cloud accounts will be under one place and you don't have to go to different apps to manage it. Make sure to try it yourself and I am sure you'll love it or at least will like it. There are also a bunch of settings to personalize your experience more. 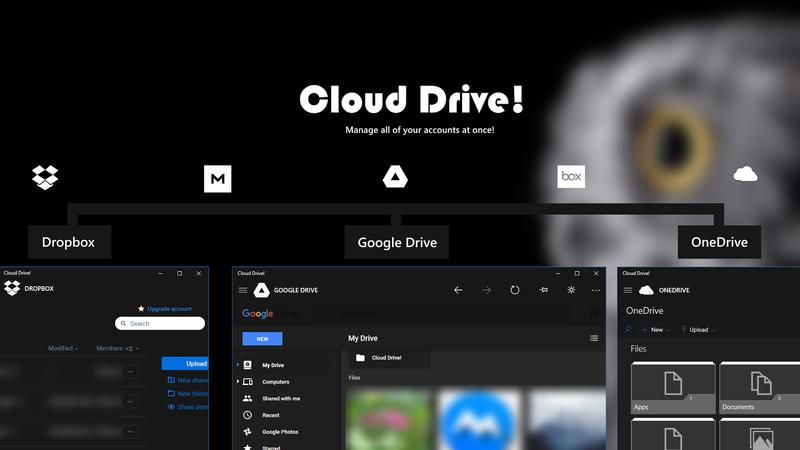 We have made Cloud Drive as fast and as beautiful as we can and will continue to improve it. Cloud Drive also gives you better privacy protection because it runs in a sandboxed(safer) environment which is much secure than anything. We do assure you that we don't store any kind of information about you. Any Application Data is stored in your own device and it can't be access by anyone. Want to give feedback about the app? Well, Contact us via mail or twitter. Download Link :- Cloud Drive! Thank You very much for taking your time to read this!